Perhaps the most famous Cairn Terrier is Toto from The Wizard of Oz, Dorothy's spunky little companion. The American Kennel Club (AKC) recognized the tough Cairn Terrier in 1913, but her ancestors were the terrier types developed in Scotland centuries ago. The Cairn Terrier was bred to be a sturdy, hardworking dog with plenty of drive and stamina—its main duty was to rid farms of fox and rodents. The wiry, thick coat is weather-resistant—perfect for working in the harsh, wet conditions of Scotland. This energetic, playful breed exhibits the dutiful nature of its predecessors and is known to chase critters, bark, and dig—so leashed walks and fences are recommended. The Cairn Terrier is also known as Cairn. Coat - The Cairn Terrier has an endearing scruffy appearance due to its wiry overcoat and soft undercoat. The coat may be a number of colors including black, brindle, cream, red, and silver. The Cairn Terrier was developed as early as the 1600s from a terrier type in Scotland known as the Scotch Terrier. These terriers were used to dig into cairns, or man-made rock formations, to rid them of rodents. Eventually, the Scotch Terrier split into two classes—Dandie Dinmont Terrier and Skye Terrier—and the Cairn was considered as the Skye Terrier type. It wasn't until 1912 that the Cairn Terrier was designated as a separate breed—the name 'Short-Coated Skye Terrier' was considered, though Skye Terrier breeders took issue with the name as they felt it would cause confusion. The American Kennel Club recognized the Cairn Terrier in 1913. Alert and intelligent Cairn Terriers are loyal little dogs with a true terrier temperament. The attention-loving Cairn's personality is often bigger than her body. Usually cheerful and affectionate, Cairns are happiest when included in the day-to-day activities of the home. They're assertive and prefer to make their own choices, but are responsive to gentle correction and praise. Are Cairn Terriers Good with Kids? Friendly and easygoing Cairn Terriers can make a good match for a household with children, if both dog and kids are appropriately supervised. They're lively dogs who love to play, but if games become too rough may bite or injure a child. Are Cairn Terriers Good with Other Pets? With early socialization and proper introductions, Cairn Terriers may do well with other pets in the household—though they are likely to initiate rowdy games of chase that timid animals may not appreciate. Their prey drive means they are not well-suited to life with pet rodents. They will keep your yard rodent-free, and may be territorial with dogs outside the home. The duty to protect property from intruders is as deep in the Cairn Terrier's DNA as its wiry coat and bright eyes. Their history of patrolling the farms of Scotland has given the modern Cairn a courageous attitude. They will sound the alarm if anyone approaches the house. Due to their size, they're not guard dogs—but their bark alerts you to newcomers in plenty of time. Energetic Cairn Terriers are always ready to go. They have plenty of terrier energy and need the appropriate exercise to burn it. The Cairn Terrier has a big dog personality in a small body. She may be territorial with other dogs outside of the home. She is known to chase and wander. She possesses the typical terrier personality. She may be destructive when left home alone. Indoor The Cairn Terrier adapts well to most indoor living situations, including apartments, but needs plenty of time to run and play to prevent destructive behaviors. They don't take up too much space and can get part of their daily exercise requirements inside—but should be given time to play and walk outdoors, too. Outdoor Playing outside and walking for a half hour or more per day will help the Cairn Terrier burn excess energy. Their coat is weather-resistant, so inclement weather need not keep them indoors—a short romp outside will be welcome in sun, rain, or snow. Time outdoors should be supervised, as the breed has a high prey drive and is likely to wander or chase, given the opportunity. If left outdoors alone, they may dig, bark, or roam. The Cairn Terrier is not a breed suited to living outdoors. Exercise A long walk or two, and a lot of play will keep the Cairn Terrier fit and happy. At least a half hour of exercise is necessary—more is better. Endurance Impressive stamina keeps the active Cairn Terrier going for hours. They were built for long hours of work, ridding farms of rodents and predators—and their impressive endurance has remained. They make a great choice for a family with an active lifestyle. Running Miles: An adult Cairn Terrier in good health may be able to run between three and five miles. Hiking Miles: Full-grown Cairn Terriers may have the energy to hike up to 10 miles, if well conditioned. They are not large enough to handle strenuous trails or steep inclines. Because Cairns tend to roam and chase, hikes should be on-leash unless the dog has impeccable off-leash behavior. Food The general recommendation for how much high-quality dry dog food to feed a Cairn Terrier is a half cup to one cup per day, given in two meals. This is based on average weight and activity level. The Cairn Terrier does not tend to guard her food more than other breeds, but children should never be allowed to touch or remove food while any dog is eating. Alone Time Though the Cairn Terrier can stay alone for four to eight hours per day, she prefers to have her people by her side as much as possible. Cairns may become destructive and are likely to bark if bored or not given enough exercise. Crate training may help prevent destructive behaviors. Cairn Terriers don't shed excessively, but weekly brushing and occasional hand-stripping—rather than trimming—are ideal to maintain the Cairn Terrier's proper coat texture. Bathing is necessary only occasionally. Trimming may be acceptable for a Cairn kept as a pet rather than for show, though it will likely soften the harsh texture of the coat. Trimming nails regularly will help prevent painful splitting and cracking, or breaking a nail. You can minimize serious health concerns in a Cairn Terrier by purchasing her from a reputable breeder who engages in responsible breeding practices, and through screening for common diseases and conditions. Because they're highly intelligent—and nearly as stubborn—training a Cairn Terrier may be a battle of wills. Once the Cairn knows who is in charge, she learns quickly and makes a well-behaved companion. A solid recall should top the training priority list as the breed is known to run, chase, and wander. Positive training methods and gentle correction work best for this sensitive breed. Keep training interesting, with plenty of praise, for the best training experience. The ready-to-work Cairn Terrier excels at Earthdog training, has a fantastic sense of smell for tracking, can learn advanced tricks, and enjoys competing in agility. The more you do to burn the Cairn Terrier's energy, the happier you'll both be. Though uncommon, it may be possible to train the Cairn Terrier as a hunting dog. A foundation of basic obedience must exist before attempting to train the strong-willed Cairn as a sporting dog. How Did the Cairn Terrier Get Its Name? These rugged little terriers are named after the piles of stones, or cairns, used to mark memorials and pathways. The Cairn Terrier was used to go into these stacked stone formations to catch mice, rats, and other critters. 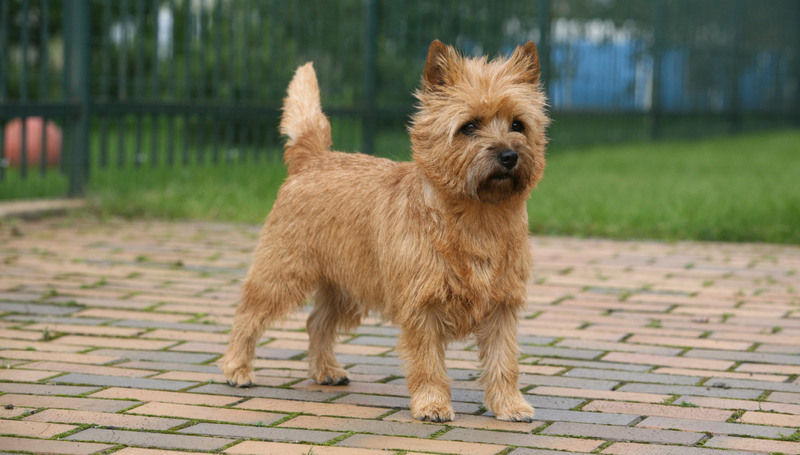 Is the Cairn Terrier Hypoallergenic? While no dog is truly allergen-free, the Cairn Terrier is considered to be hypoallergenic. The breed sheds minimally, but because all dogs produce dander and saliva—which can trigger an allergic reaction in sensitive individuals—even hypoallergenic dogs can aggravate allergies. How Do You Get a Cairn Terrier to Stop Digging? The short answer is—you don't. Digging is part of the Cairn Terrier's instinct, and it's a part of terrier life. The breed standard specifies that the forefeet are larger than the hind feet—for digging, of course. Though your yard may disagree, digging isn't all bad—it's an outlet for boredom and burns a large amount of energy. While trying to stop the excavation is futile, you can set the rules. Providing a digging-approved space for your Cairn Terrier gives her an outlet for that natural behavior, and will help protect your perfectly maintained rose beds. Train your Cairn to dig in a sandbox or designated space in the yard by hiding treats and toys in the appropriate spot and praising her when she chooses that area to mine. Redirect her to the area where she may dig each time she tries to burrow elsewhere. If no space is appropriate for digging, constant supervision may help preserve your landscaping.